The deadly dengue fever is raising its head again with experts warning that it may reach epidemic proportions in the coming months, claiming more lives and claiming a high economic toll with each dengue patient costing Rs. 50,000-60,000 a day to treat in intensive care. So far for this year, 24 deaths have been reported and more than 19,000 people made ill by the virus. Despite numerous anti-dengue drives, cases are up by 3,800 in comparison to the first six months of last year, the Health Ministry said. “We focus now on controlling dengue than eradicating it since statistics have shown no major decrease when compared with previous years,” National Dengue Control Unit (NDCU) National Coordinator Dr. Hasitha Tissera admitted. The Health Ministry was finding it hard to distinguish high-risk areas with dengue cropping up constantly in many districts, he said, adding that all four dengue serotypes were present in the country, making the disease widespread. In Jaffna district, where the third highest number of dengue cases have been reported so far this year (1,287) unclean domestic water storage tanks were the main reason for the increase in cases Jaffna Teaching Hospital Director Dr. T. Sathyamoorthy said. Most of the Jaffna dengue cases have been reported from the Karavedy area, where water is in short supply and house occupants are forced to collect water in buckets. “Even if the water buckets are emptied, the infected mosquito eggs can survive for up to six months without water,” Dr. Sathyamoorthy said. Officials in Kandy concerned about dengue cases there (1,133 to date this year) plan to get tough over the trail of rubbish that hundreds of daily visitors to the city leave behind them. The Kandy Municipal Council faces the problem of the streams of visitors leaving behind a mass of empty king coconut shells, yoghurt and ice-cream cups and other plastic receptacles, all ideal containers for stagnant water where dengue mosquitoes can breed, Kandy Hospital Deputy Director Dr. Nissanka Wijewardene said. “We plan to implement the law very strictly, regardless of whether the neighbourhoods are poor or affluent. 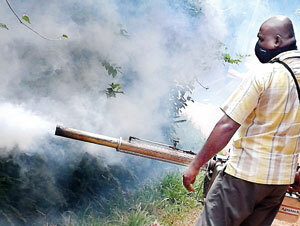 This is the only way, it seems, to control dengue in Kandy”, Dr Wijewardene said. Indifference to hygiene and health care was widespread, the Kandy Municipal Council’s chief medical officer, Dr. Asoka Senarath, said, saying there were 237 dengue cases in June alone. “People here discard garbage without bothering to tie the bags. Empty curd pots are thrown in gardens and on roads, and these collect water and become mosquito breeding spots. A radical change in behaviour patterns is needed here,” Dr. Senerath said. Public health officers and volunteers were working hard to raise levels of health awareness and promote disease prevention practices in the Kandy community. “There should be pro-active surveillance where even if only a couple of people fall ill with dengue from an area the authorities should be able to immediately visit the house, neighbourhoods, conduct cleaning programmes and fumigation,” Dr. Senerath said. Recently Kandy Hospital was filled with dengue patients and that there were still many patients of the virus under treatment, Dr Wijewardene said. 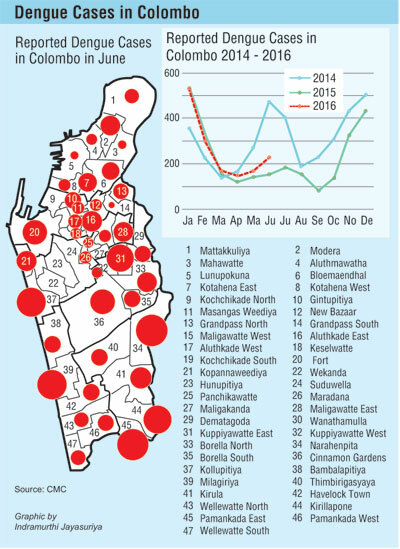 The highest number of dengue cases over the past six months was reported in Colombo (6.160), followed by the Gampaha district (1,983) according to the Health Ministry’s Epidemiology Unit. Statistics for other districts were: Hambantota 353 cases, Matara 423, Puttalam 578, Kegalle 685, Kalutara 1,252 and Batticoloa 303 cases. Colombo, Kalutara, Kandy, Gampaha, Jaffna, Kurunegala, Galle, Kegalle and Ratnapura have been identified as the highest-risk districts. A three-day “dengue eradication programme” will be conducted by the armed forces, together with the police from June 30 to July 2, the Director-General of Health Services Dr. P.G. Mahipala said. A total of 53,000 premises will be inspected, including private, state and international schools, government institutions and residences. A workforce of about 2,000 personnel attached to the national Dengue Task Force will be involved in the week-long campaign. “We have taken the Railways Department to court many times, yet commuters continue to throw discarded containers along the rail track and railway yards are not maintained properly, allowing mosquito breeding and overgrown vegetation,” Dr. Mahipala said. The military would conduct a cleanup campaign along the rail track from the Fort to Dematagoda. Dr. Mahipala said the cost to the government for treating a dengue patient in intensive care is about Rs. 50,000-60,000 a day. Almost all the provincial hospitals in Ratnapura district are packed with confirmed dengue cases, Ratnapura Provincial Hospital Director Dr. Sampath Ranaweera said. There were 172 dengue cases in Ratnapura district this month. “All hospitals, both private and state, have been instructed by the Ratnapura Municipal Council (RMC) to keep dengue patients under bed nets in order to prevent other patients, visitors and medical staff from contracting dengue. Hospital managers have been instructed to keep hospitals free of mosquito breeding,” he said. There were also many cases of a virus with similar symptoms such as fever, headache, vomiting and diarrhoea, Dr. Ranaweera said, warning hospital authorities to be vigilant. An official in the Kalutara General Hospital said there was a need to strengthen the monitoring of apartment complexes and construction sites and pointed to the fact that government flats with sunshades hold dry leaves and debris that trigger mosquito breeding. The Sri Lanka Tourism Development Authority has requests visitors travelling to the country to watch out for vector-borne diseases such as malaria and dengue fever. Tourist areas declared high-risk include Colombo city, Dehiwela-Mount Lavinia, Negombo and the Kalutara, Galle, Matara, Ratnapura, Trincomalee and Batticaloa districts. The Colombo Municipal Council (CMC) has identified eight areas where a high number of dengue cases have been reported, warning that dengue is worsening in the city. These areas are Narahenpita, Pamankade, the Miligiriya area in Bambalapitiya, Kollupitiya, Kuppiyawatte East, Cinnamon Gardens and Kirulapone. Officials said that in 8,535 premises inspected last Saturday more than 1,003 potential breeding sites were found, and of those, 142 places had mosquito larvae. CMC Chief Medical Health Officer Dr. Ruwan Wijeyamuni said when mosquito eradication programmes were focused on building sites, breeding sites in residential areas increased. “The dengue mosquito is too a very adaptable and has now started breeding indoors”, he said. The CMC said that cases had risen in some areas because more attention had been diverted to flood-affected areas. Colombo National Hospital Director Dr. Anil Jayasinghe concurred, saying that from April dengue cases had increased. “During April we had 51 cases while in May we had 53 and now there are 98 cases so far,” he said.